Showing appreciation for your bridal party is a part of wedding planning that is often overlooked. Couples are often stressed finding the perfect vendor, photographer, and caterer, that they often overlook giving back to the people that have helped them along the way. Especially our grooms! Face it – men often hate shopping and gift giving, particularly to their guy friends. So here at Magnificent Moments Weddings, we decided to take on the task and help our desperate grooms out. 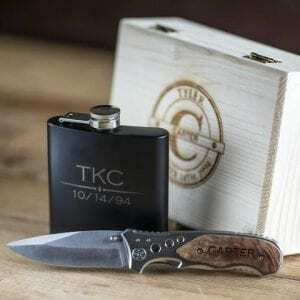 We found a great company called Groovy Guy Gifts that has some great groomsman gift options and today I want to share my top 3 picks! This box set is a great option! 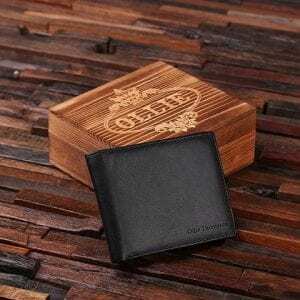 It comes in a rustic wooden gift box that has a laser engraved personalization, which would be perfect for your men to use later to store their odds and ends. Inside the box is a customizable black flask and knife that are the perfect manly gift! Personalization is key when it comes to groomsmen gifts and what better way to personalize than putting your groomsman face right on their gift! 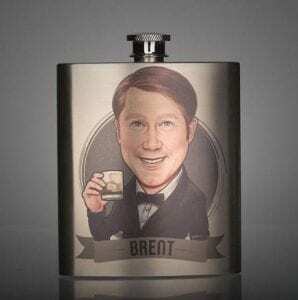 These metal flasks include a caricature of your groomsmen based on a photo you submit to the company and trust me these drawings do not disappoint! Want to get something you know they will use? A billfold is a great option, men don’t leave the house without it. Made out of genuine cow leather you can choose either brown or black and personalized with your groomsmen names. Plus it comes in a rustic wooden gift box that can also be engraved to your liking. Whatever you choose, be sure to keep the personality of your groomsmen in mind. And the great thing is Groovy Guy Gifts has so many options, you are sure to find something to fit every personality in your party! Want more help planning your big day? Contact Magnificent Moments Weddings! We are here to help with all details big and small.